대방광불화엄경은 줄여서 ‘화엄경’이라고 부르기도 하는데, 우리나라 화엄종의 근본경전으로, 부처와 중생은 둘이 아니라 하나임을 기본 사상으로 하고 있다. 『보현행원품』은 화엄경 가운데 깨달음의 세계로 들어가기 위한 방법을 보현보살이 설법한 부분이다. 이 책은 당나라 실차난타(實叉難陀)가 번역한 『화엄경』 주본 80권 가운데 권2, 권75에 해당한다. 닥종이에 찍은 목판본으로 종이를 이어붙여 두루마리처럼 만들었는데, 크기는 권2가 세로 28.7㎝, 가로 46.5㎝이고 권75가 세로 29.8㎝, 가로 46.1㎝이다. 본문의 글자가 빠진 것이 없고 내용상 다른 자는 없으나 같은 글자라도 대장도감에서 찍어낸 책에 비해 약자(略字)를 많이 썼다. 본문 중 ‘경(敬)’자와 ‘경(竟)’자에 한 획이 빠져있는 점으로 보아 송나라 때 만들어진 판본을 바탕으로 새긴 것으로 보인다. ‘경(敬)’자와 ‘경(竟)’자는 송나라 태조의 할아버지 이름으로 왕의 이름을 피하기 위해 한 획을 줄여서 쓴 것이다. 간행기록이 없어 정확한 시기는 알 수 없지만 고려 초기 대장경 가운데 하나이며, 12세기경에 찍어낸 것으로 보인다. 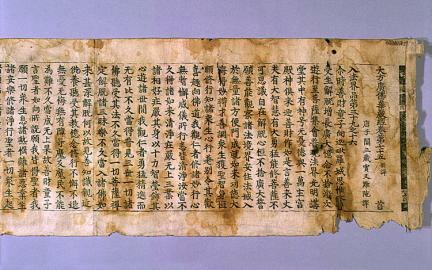 Daebanggwangbul Avatamsaka Sutra is also called by its shortened name 'the Avatamsaka Sutra.' 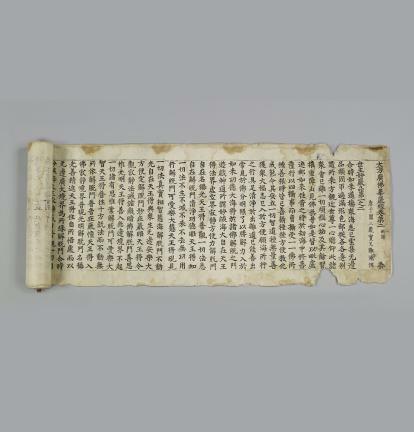 Along with the Lotus Sutra, this principal scripture of the Avatamsaka Sutra is one of the books that have the greatest influence in the establishment of Korean Buddhist philosophy. These are Books No. 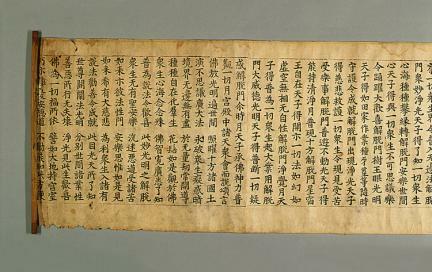 2 and 75 among the 80 books of the Avatamsaka Sutra Main Edition translated by Silchananta of the Tang Dynasty of China. 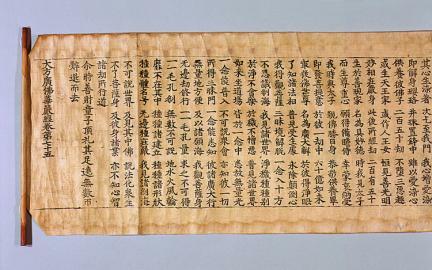 They are produced by woodblock printing on mulberry papers in the form of a scroll by joining the papers together in a row. Book No. 2 is 46.5cm long and 28.7cm wide, while Book 75 is 46.1cm long and 29.8cm wide. There is no letter missing from the text or no character different in its meaning. Nonetheless, abbreviated characters are used more often than in the books published by the government press center established in the 23rd year of King Gojong or 1236 A.D. 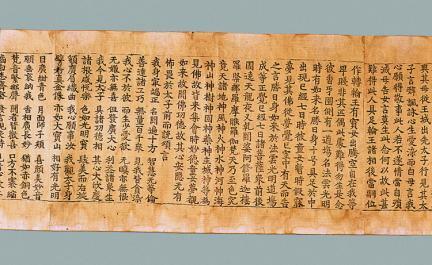 The omission of a stroke from the two characters pronounced 'gyeong' (敬 and 竟) indicates that the books are produced using the print made during the Song Dynasty of China. 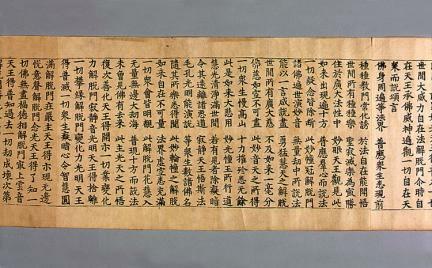 These two characters are found in the name of the grandfather of the founder of the Song Dynasty of China. 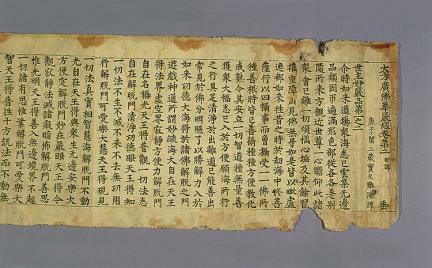 Although the exact date of their production is unknown because there is no record on it, it seems that they seem to be one of the Tripitaka from the early Goryeo Period and produced around the 12th century.